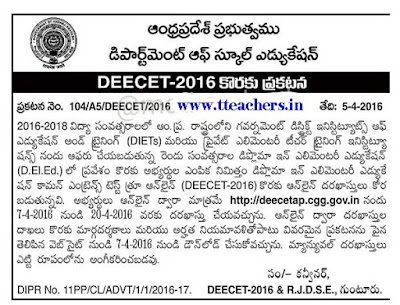 Deecet 2017 Notification in AP Dietcet Online Application :Online application for DEECET - 2016 are invited from candidates who intend to take admission into two years Diploma in Elementary Education (D.EL.Ed) in Government Deecet 2016 Notification in AP Dietcet Online Application,Ap Deecet 2016,Ap Dietcet 2016,Deecet notification 2016,dietcet notification 2016,online application of deecet 2016,online apply of dietcet 2016,eligibility,last date,submission,fee details,Ap Dietcet hall tickets,Ap Dietcet results 2016,web counselling Ap Dietcet 2016,certificate verification,Ap Dietcet 2016 web options,Ap Dietcet seat allotment order 2016,Ap Dietcet 2016provisional admission letter 2016District Institutes of Education & Training (DIETs) and Private Elementary Teacher Training Institutions in the state to be conducted by Dept. of School Education, Govt of A.P on 15-05- 2016 in all 13 Districts of the state of A.P.DEECET will be conducted on 15-05-2016 in all 13 Districts of the state of A.P. The test will be conducted through online in 3 spells. Detailed procedure for applying ONLINE is given in the Information Bulletin. Candidates can download the “Information Bulletin” free of cost from the DEECET website deecetap.cgg.gov.in from 07-04-2016 onwards. Candidates can submit their applications through online from 07-04-2016 to 20-04-2016..